[6 mins. 6 secs.] 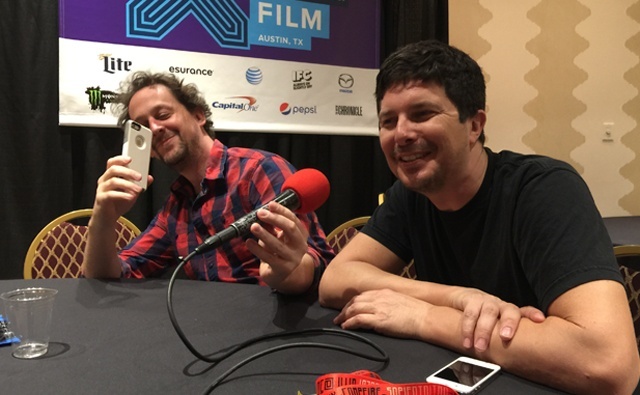 Another episode recorded from SxSW 2015. The first segment includes a conversation with the filmmaking team behind the film "God Bless The Child", co-directors Robert Machoian & Rodrigo Ojeda-Beck. Harper, the oldest sister of five, is put in a position to care for her four younger brothers. Elias the crazy, Arri the sensitive, Ezra the strong and Jonah the baby. What should just be a normal day in their lives, turns into a day of fantasy and chaos. [18 mins. 12 secs.] Next up, the "Uncle Kent 2" creative team, actor/artist Kent Osborne & director Todd Rohal. In a desperate search to create a follow-up to Joe Swanberg's 2011 film "Uncle Kent", Kent Osborne travels to a comic book convention in San Diego where he loses his mind and confronts the end of the world. Reuniting in the Gremlins 2 of 'Indie' sequels, Joe Swanberg, Jennifer Prediger and Tipper Newton return in a surrealist look into Osborne's madness. Written by Osborne and passing the directors' torch over to Todd Rohal ("The Catechism Cataclysm") "Uncle Kent 2" plays out like an absurdist successor that bends the rules of sequels and the minds of the audience. [58 mins. 5 secs.] Lastly, Austin-based filmmaker & graphic designer Yen Tan ("Pit Stop") discusses his filmmaking.